Do you have an adorable baby in your life who gets the sun in her/his eyes outside? Then I have the perfect solution for you! 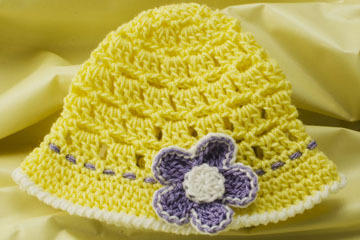 Our Baby Sun Hat crochet pattern is perfect for keeping the sun off baby’s face and head, while looking great at the same time! This pattern comes in 3 sizes for newborns, babies and toddlers. 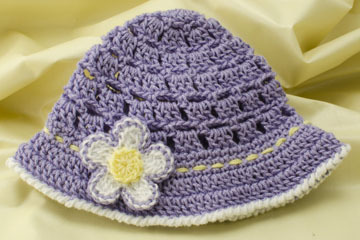 The circumference of the hat (made with the same gauge as the pattern) is 12” for newborns, 14” for babies and 16” for toddlers. Our baby sun hats were made with Red Heart Baby Sheen, which is a fine/sport weight acrylic yarn, but you can make your sun hats with any comparable yarn you choose. The instructions for each size of this sun hat are written separately, making it easier to follow the instructions for the size you’re going to make. 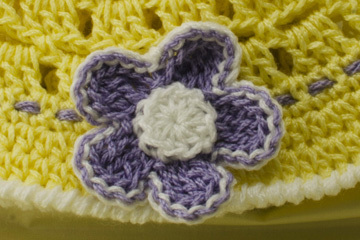 The hat includes an optional crocheted flower and a contrasting bottom edging (worked in reverse single crochet). 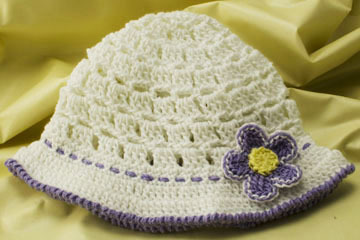 The woven strands of yarn at the top of the brim make the hat slightly adjustable as baby grows! Just untie the bow, loosen the strands a little, and tie the bow again, allowing the hat to stretch more on baby’s head. If the hat is too big for baby, don’t despair! Just untie the bow, tighten the strands a little, and tie the bow again, making the circumference of the hat a little smaller until baby grows a little more. Doesn’t Ivy look adorable in this sun hat? I think so! 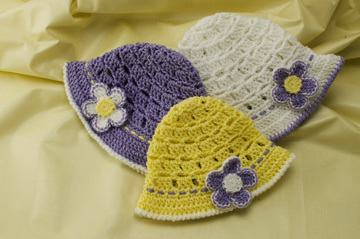 The pattern is available for purchase on our “Patterns” page for just $4.95. I hope you thoroughly enjoy this new crochet pattern. If you have any questions about it, please don’t hesitate to ask. I’m happy to help! 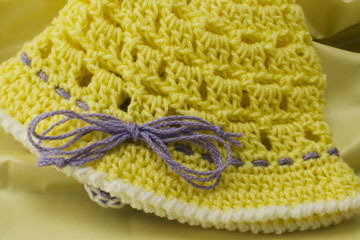 This entry was posted in Crochet patterns, Crochet patterns for baby and tagged baby crochet patterns, crochet patterns. Bookmark the permalink. 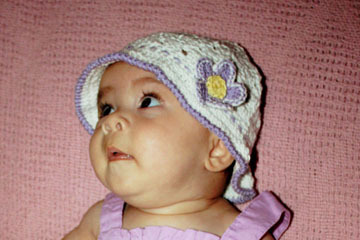 2 Responses to New Crochet Hat Pattern for Babies! I’m glad you like my Baby Sun Hat. I agree that it would also be great for CPC (and your new niece or nephew)! If you have any questions about the pattern, please don’t hesitate to ask! 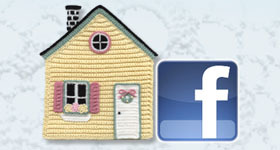 I aim to help you increase your crochet skills and knowledge so your unraveling time will be less with each project!